The Superstar Shake-up took place tonight on Monday Night Raw. With several stars jumping to the flagship show, including The Miz and the Viking Experience, another former champion was advertised for Raw in the coming weeks. Cedric Alexander carried the weight of 205 Live for the better part of a year in 2018. After the Cruiserweight Championship was stripped from Enzo Amore, a tournament was put together to find the new champion. For months, the WWE Universe saw the greatest cruiserweight action available, featuring guys like Buddy Murphy, Roderick Strong, Mustafa Ali, Drew Gulak and more. However, one man managed to rise above the rest and continue to deliver barn burners over the course of the year, the Soul of 205 Live, Cedric Alexander. Capturing the Cruiserweight Championship at WrestleMania 34, he held it for 181 days and maintained an undefeated streak for even longer. Toppling the likes of Murphy, Hideo Itami, Drew Gulak, Brian Kendrick and more, his title reign helped give the championship worth. Though he lost it to Murphy at Super Show-Down, he continued to fight near the top of the card for months on end, looking to regain his crown. Tonight, it was revealed that Cedric Alexander would be joining the Monday Night Raw roster. Alexander's friend Ali had already been added to SmackDown Live near the end of 2018. With these two rivals sitting across from each other on separate brands, it will be interesting to see what they do to one-up each other. Cedric Alexander is one of the most athletic wrestlers in the business today. 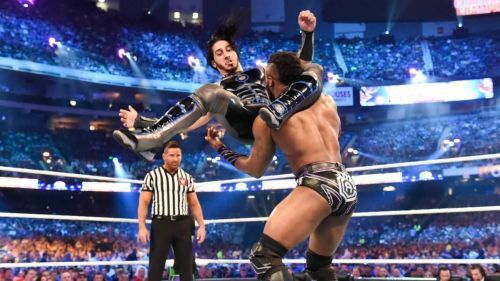 With a complex moveset that features both high-flying and power moves, and one of the best finishers in the business, The Lumbar Check, the Soul of 205 Live has every tool necessary to take on any foe. With a jump to Monday Night Raw, he'll have the opportunity to show the rest of the WWE Universe exactly what they've been missing.